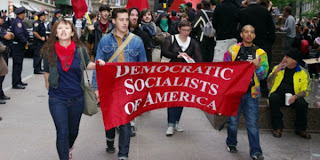 Democratic Socialists Hold Convention in Washington: Responding to the Economic Crisis: Beyond the Washington Consensus. DSA is a member of the Progressive Alliance. A plenary session at 1:30 PM on Friday will kick off national convention of DSA, the Democratic Socialists of America to be held from Nov. 11 through Nov. 13 at the Sheraton Premiere at Tysons Corner located at 8661 Leesburg Pike, Vienna, VA.
DSA, the U.S. affiliate of the Socialist International, is the largest socialist political organization in the country with over 7000 members and active locals in more 40 U.S. cities and college campuses. DSA members reside in all 50 states. A public outreach event “Equality and Jobs for the 99%: Economic Justice for All” featuring speakers labor leader and immigration reform activist Eliseo Medina, author John Nichols, and local activists occurs at 7 p.m. on Nov. 11 at the St. Stephen and Incarnation Church at 1525 Newton St. NW, Washington, D.C.
Thirty years of deregulation, deunionization, privatization, and tax cuts for the rich, along with two unfunded wars, have robbed the public sector of the revenues needed to fund basic social services. While Republicans and Democrats trumpet the long range deficit as the major threat, DSA argues that we face not a debt crisis, but a political crisis and a jobs crisis. Extreme economic inequality, coupled with the capital crisis, has produced a shortfall of demand—similar to the U.S. economic situation of 1930–1936. In response to this demand crisis, we must put ordinary people back to work through a public jobs program. This fifteenth bi-annual convention is the first major organizational function under the leadership of DSA’s new national director, Maria Svart. Elected delegates will determine DSA’s political direction and elect its National Political Committee; attend workshops and plenary sessions about the jobs crisis, higher education, and DSA’s Economic Literacy Project; and participate in trainings that will empower them to fight the attacks on unions, social insurance, and anti-poverty programs. 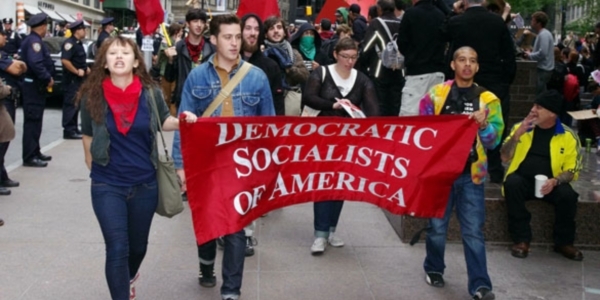 DSA Locals in New York, Boston, Philadelphia, Chicago, Wichita, among others, have taken an active role in the Occupy Wall Street, Occupy Freedom Plaza, and other Occupy protests. DSA’s members know that the corporate dominated political system will move in a progressive direction only if powerful democratic social movements (including Occupy Wall Street, students, and labor) force it to do so. DSA gathers in convention to plan its participation in building such a movement. For a full press kit email as listed above. Labels: Democratic Socialists of America, dsa, occupy wall street, Washington D.C.